I’ve been sitting on my *ss for a whole month now, after being sidelined with a broken pelvis from a bad bike crash. You can see the CAT scan on my Instagram. 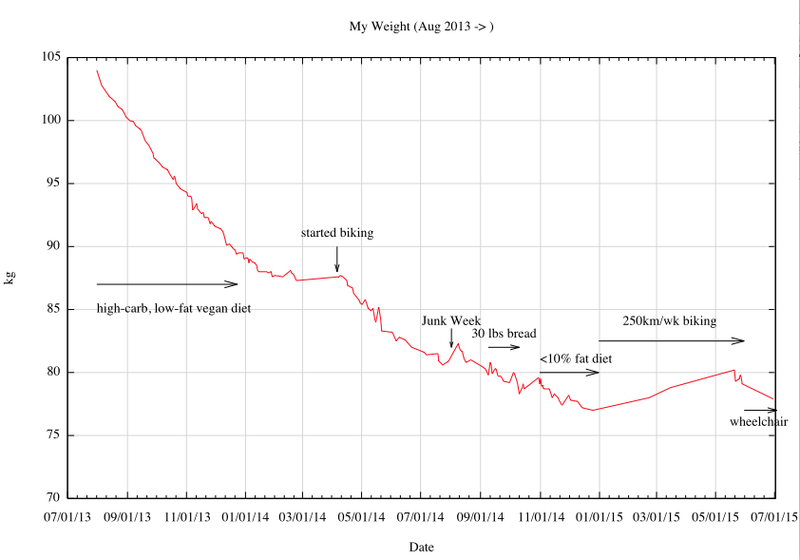 I had been slowly gaining weight prior to the crash, even though I was cycling like a madman. I rode an average of 250 km/week, sometimes even 400 km, all on a fixie, as fast as I could. I was getting frustrated by my weight. I was eating too much unhealthy (non-vegan?) foods, and the scale was moving in the wrong direction. I keep re-learning the same lesson: unhealthy foods lead to over-eating, and you can’t outrun your fork. After the accident, everyone (including myself) thought I’d gain weight. After all, I was going from 250km/week to sitting in a wheelchair for a month. And my diet is unlimited amounts of carbs. Well, I kept eating the same starch-based diet with lots of fruits and vegetables, minimizing added fats. I just ate a lot less, because I wasn’t hungry. I never deprived myself, and didn’t worry or obsess about my weight. I could tell I wasn’t putting on any weight, so I just kept eating what I know to be healthy. I ate boxes of pasta, made into simple salads with avocado, onions, peppers, garlic, and tomatoes. I made rice and vegetables, and my usual curries and soups. I ordered big rice and bean burritos, two at a time, from Bearito Repulblic. I ate as much as I wanted, until I was full. This is basic Starch Solution eating. When I could finally stand again, I thought I’d weigh myself. (I probably wouldn’t have, had I thought I ‘d gained.) As I thought, I lost weight. I weighed myself again a few days later, and confirmed what I felt. I was maintaining my weight with very little physical activity, and not changing my starch and vegetable diet. Now this might not be good news. I’m afraid of losing left leg muscle while my bones heal. I’m hoping that the body thinks this is just laying around on the couch for a month. I’ll start off slowly once I’m back on my feet. I’ll keep weighing in, and will stick to a low-fat, whole foods diet. I’d like to end up in better shape in a few months than I was last month before the accident. Let this be a datapoint: you don’t need to burn thousands of calories a day from physical activity to eat carbs. Carbs by themselves aren’t fattening. The body won’t convert them to fat, unless you really try to overfeed yourself on them. You’re not going to get fat on fruits and vegetables, even sitting in a wheelchair. Next Post → I’m On The Potato Diet! hey!!! no more postings? We miss you! We want to know from you! Really, I have been following your experiment because you inspired me to start this HCLF thing. Your weight gain is interesting since it corresponds to a crazy period in terms of biking. Have you considered that you are simply biking too much too fast ? Yes, you ate without restraint but that does not necessarily mean you will gain bad weight. However, the big factor here is how stressing it is to be so active. When you stopped due to your accident, sure you ate less, but you also decreased physical (and probably overall) stress. And to ramp up metabolism, have some weight lifting sessions 3 to 4 times a week (stress the muscle in an anaerobic way) and make sure you eat enough proteins throughout. You resting metabolic rate will be increased thanks to that. But try to maintain a moderate caloric restriction. If you feel hungry, hit the proteins (whey shake, Icelandic skyr, very lean meat / fish). Conclusion: your insane biking shows that intense daily cardio is counterproductive.